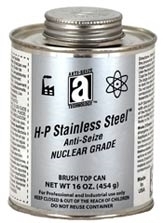 H-P Stainless Steel™ Anti-Seize Compound, Nuclear Grade, is formulated with ultra pure graphite and stainless steel powder to meet the demanding requirements of the Nuclear and electrical power generating industry. Each Lot is rigorously tested for halogens, sulfur, nitrates, nitrides, and low melting metal elements specifically restricted for use in Nuclear power plants. Exceeds the purity requirements set forth by Westinghouse and General Electric for use in nuclear power plants as well as turbine applications. H-P Stainless Steel™ Anti-Seize Compound, Nuclear Grade contains a premium, fully synthetic, non-melting base grease to withstand temperatures in excess of 450°F (232°C). It will not drip at extreme temperatures. Stainless Steel fillers form a laminar matrix of overlapping particles to shield out moisture, providing a high degree of chemical, corrosion, and UV resistance. Will provide thermal resistance from -50°F to 2400°F (-46°C-1316°C).